Special Offer. Buy 6 Bottles for £62.50 each. Save £30.00 !! Veuve Clicquot Extra Brut Extra Old is a new style for the maison exploring new winemaking territories, to introduce its first ever 'official' low-dosage cuvée. Double ageing, three years on lees in vats (up to 5% oak), then three years in bottle before release, of only reserve wines with a low dosage creates the perfect balance of strength, aromatic intensity, freshness and silkiness. Called Extra Brut Extra Old, the new Champagne comes with a dosage of 3 g/l, placing the blend in the Extra Brut category, which is used for Champagne with 6g/l of sugar or lower. Cellar Master, Dominique Demarville, stresses that the very low dosage in the cuvée is due to the richness of the wines used to make the Champagne, which in turn are a result of their age - and hence the name of the new blend: Extra Brut Extra Old. "Extra Brut is a consequence of Extra Old," he states. In fact, the new Champagne is made entirely with reserve wines from six different vintages, spanning harvests from 1988, 1996, 2006, 2008, 2009 and 2010, meaning that all the wines in the cuvée have been aged for a minimum of three years on their lees in stainless steel tanks. 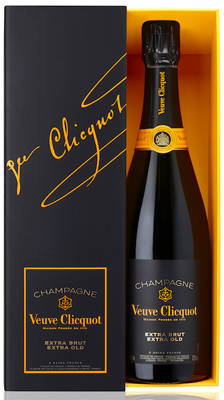 The reserve wines have then been blended and matured for a further three years in bottle, followed by nearly another year in Veuve Clicquot's cellars after disgorgement. Limited production of 30,000 bottles. Key to the character of the wine is a "creaminess", said Demarville. "When we started working on the blend the idea was to make a wine with creaminess, and to balance that with purity and salinity: so when we selected the reserve wines for Extra Brut Extra Old, we wanted to get the perfect balance between a creamy, silky texture - which comes from ageing wines on the lees - and a freshness," recorded Demarville. So, despite the 'Extra Old' in the name (and black label), the result is a bright, refreshing and very dry style of Champagne that could be enjoyed as an aperitif, as well as with lighter styles of food such as shellfish. The delicate and fresh character of the Champagne stems in part from the low dosage, but also the fact that the bubbles are very fine - Extra Brut Extra Old has 25% lower pressure than normal: 4.5 bars compared to the standard 6 bars for Yellow Label.